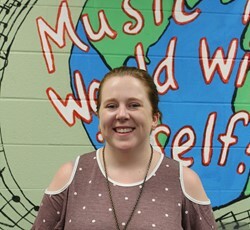 Allen County Intermediate Center music educator Brittany Rust has been selected as the Kentucky Music Educators Association (KMEA) Third District Elementary Music Educator of the Year. Rust is starting her fifth year at the Intermediate Center. She received her undergraduate degree in Music Education at Murray State University and a Masters in Music Education from Western Kentucky University. The award is based on a nomination from a music colleague and is peer-selected in recognition of the work a music educator does in the classroom and beyond. In addition to daily music education instruction at ACIC, Rust oversees the school’s choir students and is active with the Scottsville Summer Soundz program---a community children’s choir initiative by the Allen County-Scottsville Arts Council that includes 60 Allen County children. As a music educator, Rust hopes that her students develop a love and appreciation for music that will be passed on to future generations. Rust’s selection at the regional level qualifies her for consideration for the KMEA State Elementary Music Educator of the Year Award. The state awards are announced early next year.